The following is a training document that I put together for my coworkers. I have decided to share it here in case it helps anyone. 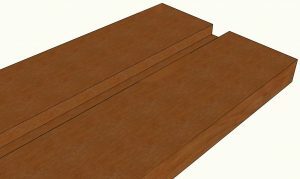 Dadoes are slots, or non-through cuts, in material. 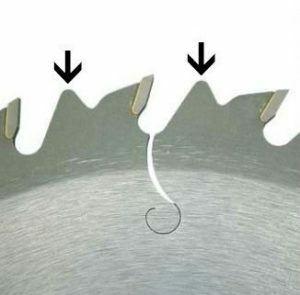 They are “non-through” meaning that the blade doesn’t actually cut the material in two. Dadoes are defined as being across the grain. 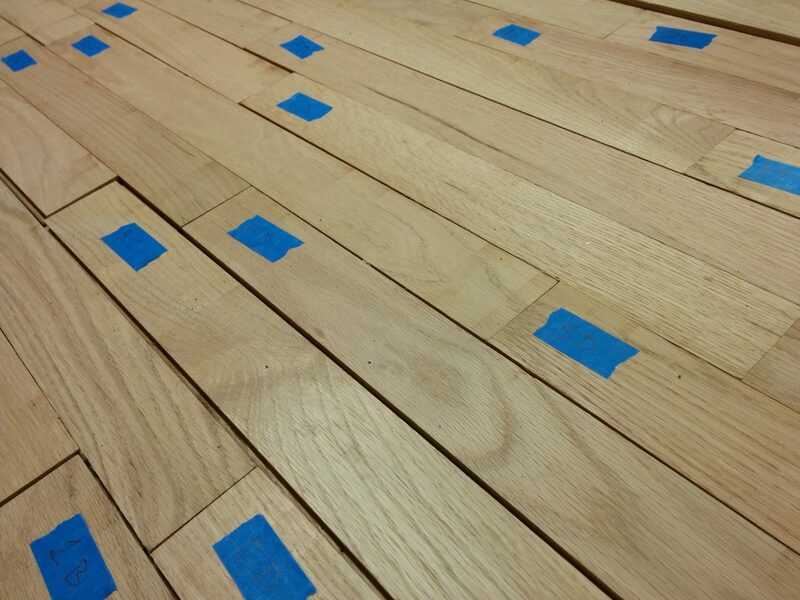 Through dadoes go all the way across the work-piece from edge to edge and are the most common type of dado. They are common when putting together shelves or cabinetry. Stopped (or “blind”) dadoes end before the edge of the work-piece. They are called “blind” because they are not visible from the front of the piece. When cutting blind dadoes, you run the material over the blade but stop short of the trailing edge. Due to the curve of the blade, this leaves some extra material that can be removed with a chisel. Grooves are essentially dadoes that run with – or parallel to – the grain. Other than that, there isn’t any real difference and as such, grooves are usually referred to as dadoes as well. Rabbets (sometimes referred to as rebates) are dadoes at the edge of a work-piece. 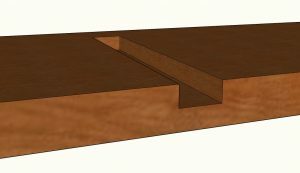 Where a dado would have three edges – two sides and a bottom -, a rabbet only has two – one side and a bottom. 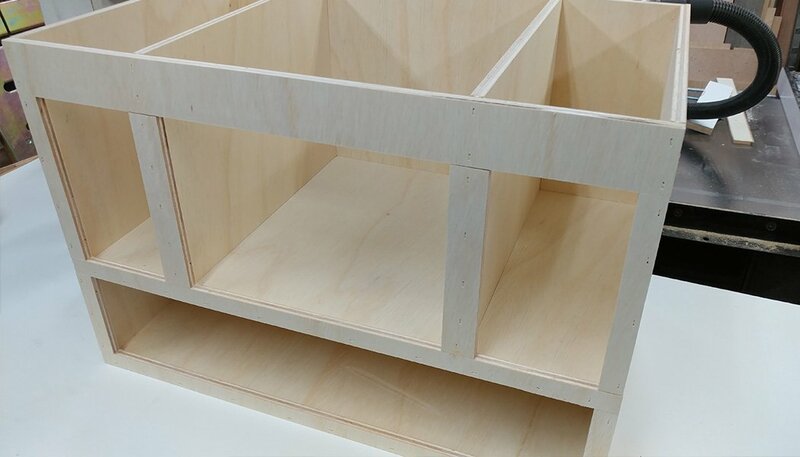 Rabbets are usually implemented when attaching the top to a cabinet or a set of shelves. 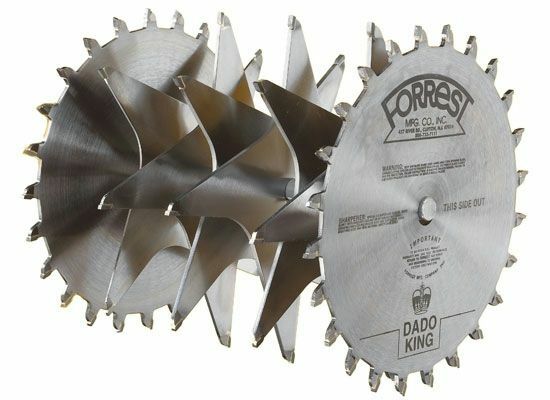 The outer blades cut the walls of the dado.These are full blades with usually around 24 teeth. The chippers remove the waste between the outer blades. 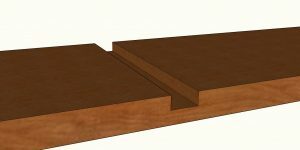 A dado stack will come with several of these, usually of varying thicknesses that can be combined with the outer blades to make a dado of a specific width. They will typically be available in three different styles. 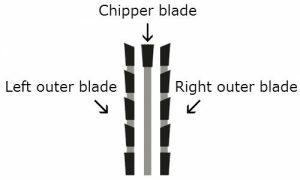 Full-plate chippers are circular blades and are not recommended on a SawStop because, due to their mass, they can damage the arbor shaft if the brake activates. 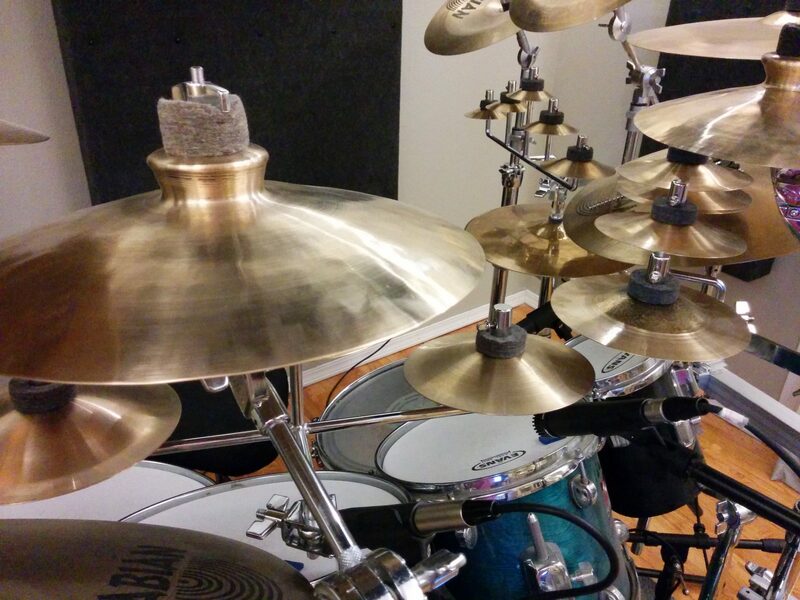 Plus-style chippers, sometimes called 4-tooth chippers, are just how they sound; plus-shaped with 4-teeth. These work fine on a SawStop. Probably the most common style is the wing-style chippers. These are roughly rectangular in shape with usually just one tooth on each end. 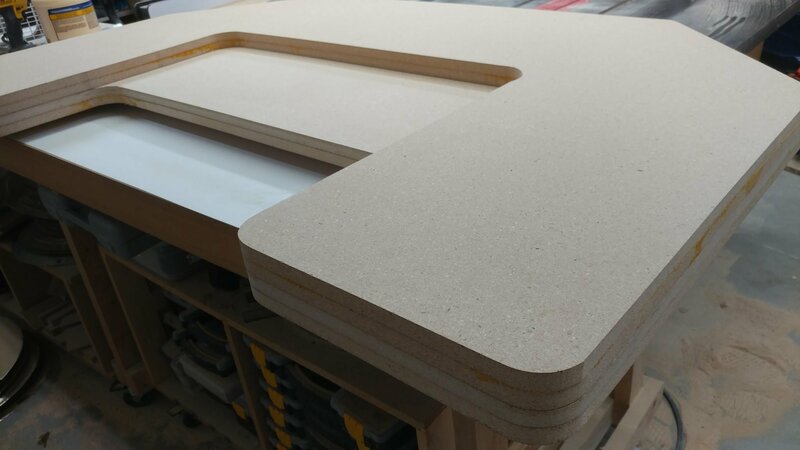 Most dado stacks come with shims of varying thicknesses that can be used for fine tuning the thickness of the dado stack. These will be inserted in between the blades and/or chippers. This is a common technique when cutting dadoes for shelves since plywood is commonly slightly undersized. To install a dado stack, you will start with the left-outer blade. Note: The outer blades should be labeled as left or right. If not, it may help to look at the carbides. When examining them from the front, the carbides will typically stick out past the edge of the blade on the side that would be considered to be the “outside” of the dado stack. The side of the carbide that is on the inside will probably be flush with the surface of the blade. After installing the left outer blade, you will follow the directions in the dado stack for setting it to the correct thickness. 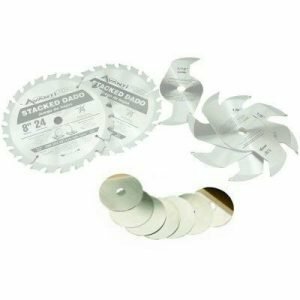 Some dado stacks come with a chart that shows you what combination of blades, chippers, and shims need to be installed in order to achieve the desired thickness. For example, to make a simple ¼” dado, you will need to only install the two outer blades. 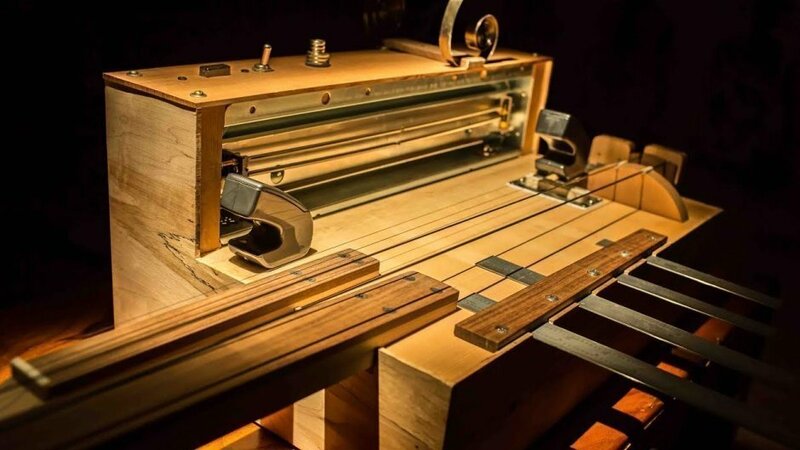 To make a ¾” dado, you will need to use both outer blades and all of the chippers. The only thing to be careful of is that you want to make sure that you stagger the teeth so the carbides aren’t touching. 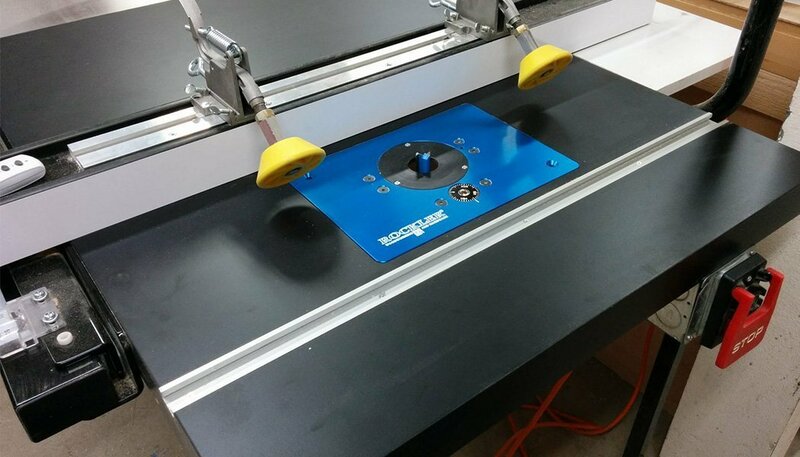 When making cuts that are ⅜” or thicker, there is no need to use the arbor flange. You may find that once you install a ¾” dado stack, there is no room for the arbor flange and the arbor nut. This is fairly standard with 10” table saws, although there are exceptions. When using an 8” dado stack, you will not use the riving knife since it will stick up higher than the top of the blade. This would prevent you from making a non-through cut. You can use a standard 10” blade and brake to make a ⅛” wide dado, which will allow you to use the riving knife. This is like making a regular cut except the blade is lowered so it isn’t cutting all the way through the material. You will never use the blade guard when cutting dadoes of any diameter as it will completely prevent you from making a non-through cut. Dado stacks are typically found in 6” or 8” diameters, with 8” being the most common. 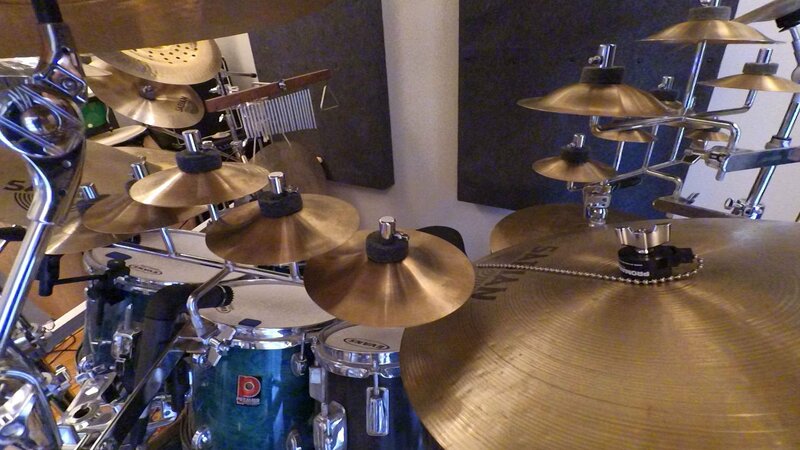 Although you may run across 10” or 12” sets, they are pretty rare. It takes a lot of power to get a dado stack spinning, so some saw users with weaker machines may find themselves wanting to use a 6” set. The larger the diameter, the faster the outer edge of the blade will spin, which results in cleaner cuts. Only 8” dado stacks will work on a SawStop. Some blades are equipped with anti-kickback shoulders (sometimes referred to as depth-limiting shoulders). This is a feature that is supposed to help prevent kickback and is common on Freud blades. 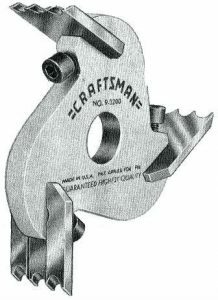 They consist of points or bumps on the saw tooth immediately following the carbide. These are not recommended for use with a SawStop as they can cause it to take significantly longer to stop the blade if the brake activates. As stated previously, full blade chippers are not recommended on a SawStop due to the amount of mass involved. 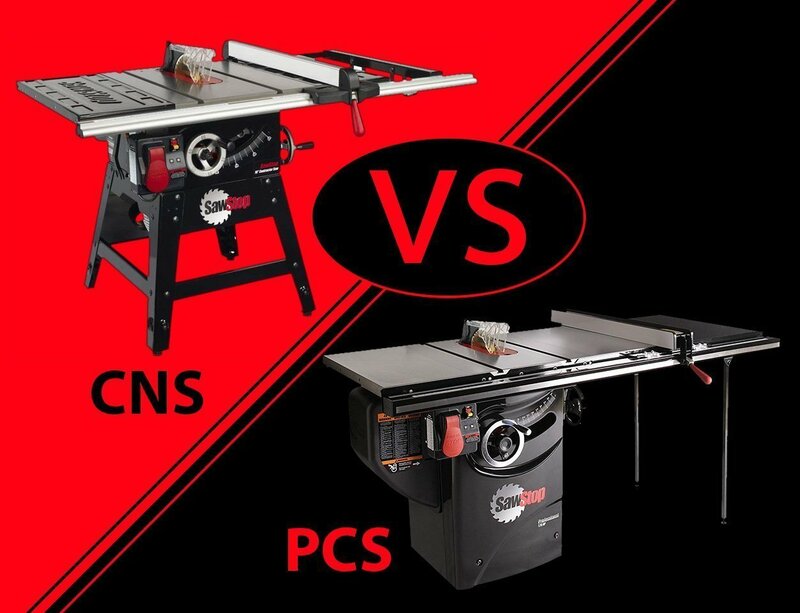 The types of chippers that we recommend are the “plus-style” or the more common “wing-style” chippers. A popular choice for dado stacks is the DeWalt DW7670, which has plus-style chippers and excellent carbides. You may occasionally hear about wobble dado stacks which consist of a single blade with a central hub that it attaches to, allowing it to be adjusted to ride at an angle. The greater the angle, the wider the dado. These are pretty old-school and not that common. Wobble dadoes have many disadvantages. They are fairly unsafe and don’t give as nice of a cut due to the vibration from the blade and the difficulty in getting it adjusted correctly. Also, the bottom of the dado isn’t flat since the blade rests at an angle. Another type of blade that you may encounter is called a molding head. This consists of a number of interchangeable profiled blades, typically three, that attach to a central hub. You pass the wood across the molding head blade similarly to how you would cut a dado. These are not compatible with a SawStop since there are too few teeth. The minimum tooth count that is recommended is 24. The SawStop dado cartridge (TSDC-8R2) and the standard brake cartridge (TSBC-10R2) have some significant differences. 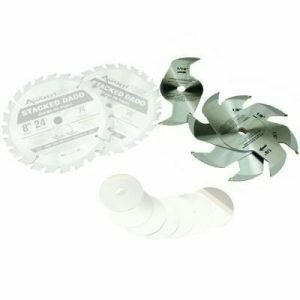 The dado brakes aluminium pawl is both deeper and wider, allowing it to work with a blade that is smaller in diameter and up to 13/16” thick. There are software differences as well, including having the cartridge allow more time for the blade to get up to speed. 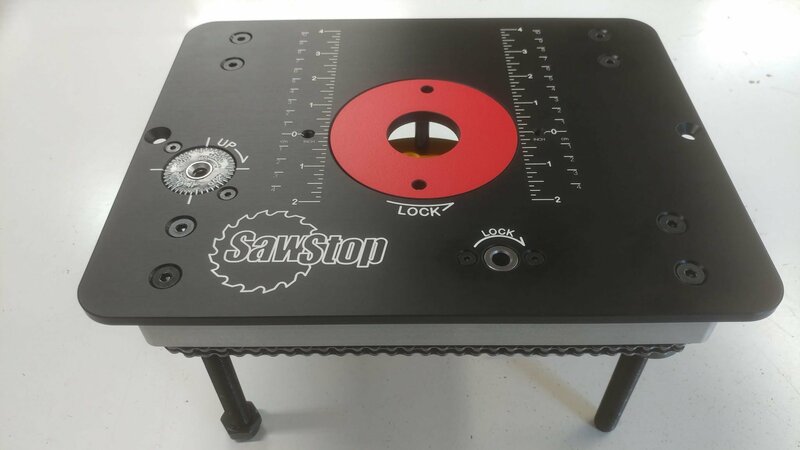 Talked to you thru Sawstop, it seems like the DW7670 would be a good choice for my Sawstop 3hp Pro? You mentioned another brand that I cant recall that you said would be good also? That would be the Forrest Dado King. Great info!! 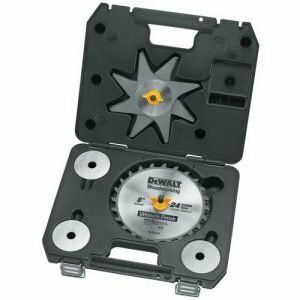 Quick question about miter saw blades. 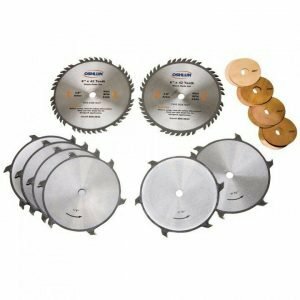 Which 12″ miter saw blade do you think is the best. I know if you ask ten different people you might get ten different answers but I would like to know your thoughts. Sadly, I don’t have a lot of experience with 12″ blades for miter saws. I would check over at Lumberjocks. Most people will just tell you that the one they use is the best. I like to find out which ones they dislike and why. I tend to learn a lot more this way, specifically what to look for and what to avoid. Then I can make my own decision. the sharpest blade is best. If the blade is one of the cheaper ones that come with the saw, I would recommend sending it out and getting it sharpened professionally before use. Avoid the blades with shiny paint all over the blade and teeth. Spend a minimum of 40$ on it but around 60$ would make more sense. Also, get a thinner blade as thicker ones kick more when turning on the saw and also take lots more power to cut thru thicker stock. Dewalt saws are a bit underpowered. When researching blades I tried Ridge Carbide, Forrest, Amanda, Freud, and Tenryu. I settled on Ridge Carbide as my go-to-blades and dado stack. I like the larger carbide giving me more sharpening per blade, they make as fine a cut as any blade I have ever used, and I believe that due to the longer life of the blade I get more “cut to the buck” even though they are not the least expensive. Of course if you are not doing enough work to sharpen a blade completely away, go with the least expensive one that provides the quality of cut you need. 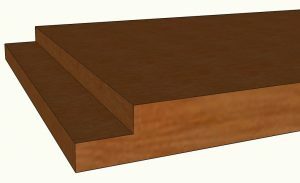 Also, if you are cutting dados with your table saw blade you will not get a flat bottom unless you are using a Flat Top Blade (FTB), often referred to as a Box Blade. Most combination blades have an Alternate Top Bevel with Raker (ATBR) and will leave little “bat ears” in the corner of the cut. 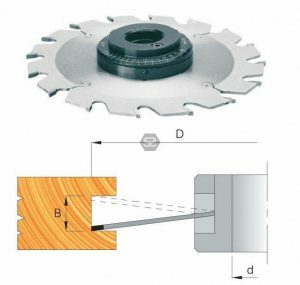 You can learn about anything you want to know concerning saw blades at the Circular Saw Blades site (http://circularsawblade.net/). 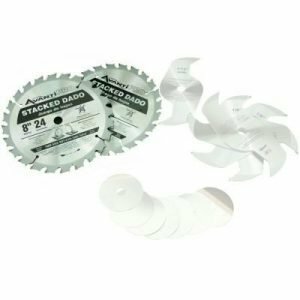 Can you make your own dado stack by buying two 8″ blades (Diablo?) and creating a “sandwich” with chippers and spacers? I wouldn’t recommend it. I strongly recommend the DeWalt Dado stack linked to above. Various other dado stacks are listed in the following article. I bet you could find a good one there for not much more than what you are proposing.